This exciting option takes full advantage of our oceanfront for kayaking and of nearby mountains for hiking and camping. Rooted in an appreciation of the natural BC environment, the program teaches students to respect and protect the environment through responsible use and service. This term is reserved for Grade 11 and 12 students only. The early focus of this term is on kayaking skills in preparation for a multi-day sea-kayak trip in early October. Students begin with wet exits and basic safety and proceed to learn proper forward stroke technique, basic handling of the kayak, and care of the equipment. Parallel with this, students learn to use camping equipment such as camp stoves, tarps and tents.The sea kayak trip is in the Gulf Islands, and often departs from and returns to the Brentwood dock. After this trip, the emphasis changes to hiking and climbing, with visits to indoor climbing gyms, and day hikes on local trails. Skills taught include top-rope climbing and belaying indoors and bouldering skills. More advanced climbers have an opportunity to learn to lead climb indoors. Late term options include overnight hiking trips on the Juan de Fuca trail, or day trips to go kayak-surfing at Jordan River. This term is open to all students, with priority given to students in Grades 9 - 10. Experienced senior students are counted on for leadership positions. Students learn a variety of basic kayaking and camping skills: campsite selection, setting up a tent, operating camp stoves safely, selecting proper clothing for outdoor activities, campsite cooking, the art of tarping, lighting campfires, and trail and campsite etiquette. An introduction to kayak safety is completed in an indoor pool, followed by many sport afternoons paddling on Mill Bay, culminating in a kayak journey and cook out on a local beach. 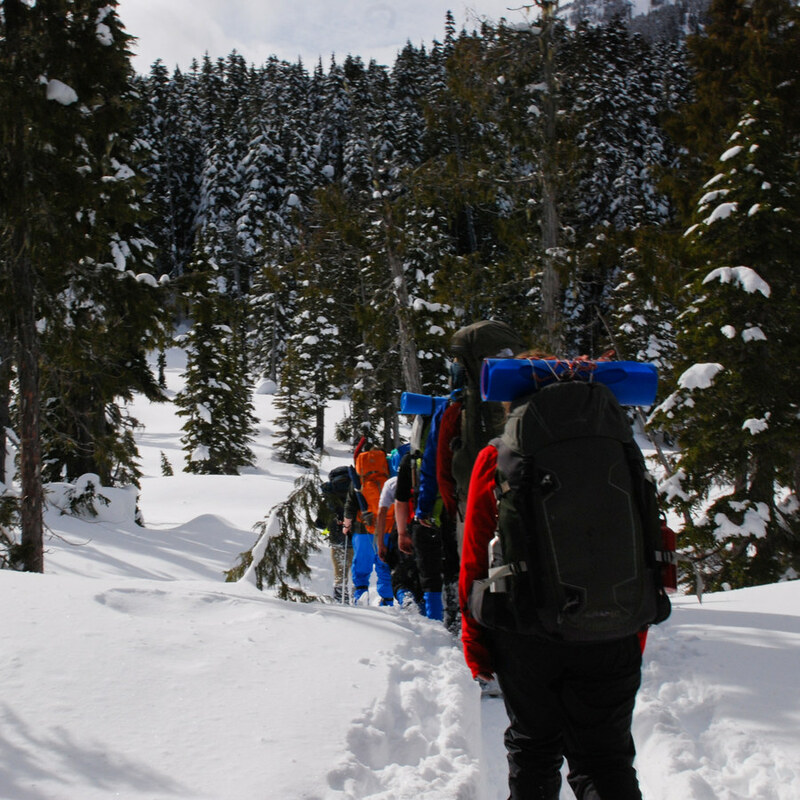 This term usually involves one overnight snowshoe camp-out, with avalanche awareness training. Additional activities include day hikes, paddling on Mill Bay, canoe polo, indoor climbing, and an introduction to wilderness first aid A 50 hour Wilderness First Aid course is often offered in this term as an extra for students who choose to take on this extra commitment. This term is open to all students. Initially, all students participate in basic hiking, an introduction to kayaking and rock climbing. After a short time, each student must choose to specialize in either whitewater kayaking or rock climbing. The whitewater paddlers head to the nearby Cowichan River at least once a week, where safety and paddling skills are taught and practiced. The students host a whitewater event for the BC paddling community in April and travel to paddle other rivers such as the Puntledge or Chilliwack. The rock climbing group travels by bicycle to a local indoor rock climbing gym where they learn how to top-rope climb and belay and develop fitness and technique on the indoor wall. Near the end of the term when the rocks are a little drier, the climbers will get several opportunities to climb outdoors in the Cowichan Valley and other locations such as Squamish or Crest Creek Crags.